Commanding officer of the late Yoni Netanyahu presents PM with Haggadah, books, and other items used by his brother. 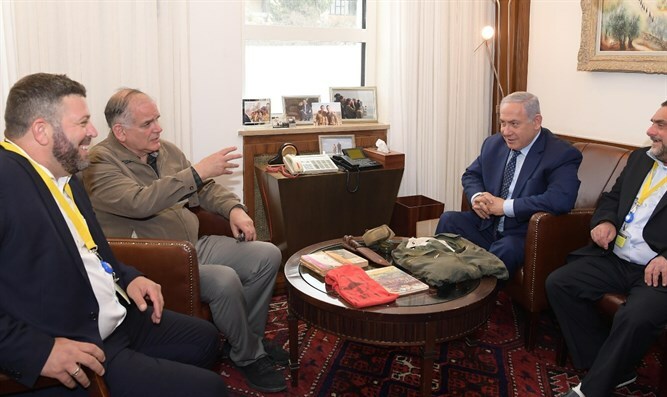 Prime Minister Binyamin Netanyahu and his brother Dr. Ido Netanyahu met with Yosef Shemesh, who was the commanding officer of the late Yonatan Netanyahu in the Armored Corps, and received personal items which belonged to their brother. Yonatan Netanyahu was killed while leading Operation Thunderbolt, which rescued over 100 Jewish hostages at the Entebbe Airport in 1976. The items Shemesh presented to the brothers included Yoni's commando knife, a Passover Haggadah, a shirt, books he had given Yosef, a sleeping bag, a pair of gloves, and a compass. Prime Minister Netanyahu was emotional as he received his brother's belongings 43 years after his death. "Yosef was a soldier of June in the Armored Corps, Battalion 71, in the Golan Heights after the Yom Kippur War, and since then he has kept personal items from Yoni and brought them to us now." "My brother Ido and I are very moved. We recognize some of these things, this commando unit was in the unit. We know Yoni's books, and there is now a Haggadah for Passover, which he used in the seder he gave his soldiers. This is a very moving reminder from the past. I thank you very much," the prime minister said. Ido Netanyahu added, "It is exciting after so many years to see these things, especially to see the same Haggadah that Yoni wrote about in his letters, and he wrote about the special arrangement he made in the battalion in a very special and very moving letter."